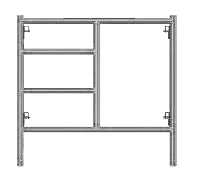 Consists of a rigid welded frame of two verticals and two horizontals of 40 mm NB ‘ b ’ class tube. The frames are inter-connected by scissor cross braces of 20 mm NB ‘ B ’ Class tube through pins welded on frame and locked in position by spring clips. Cross Braces: Suitable for frame spacing of 2.0, 1.5 and 1.0 m. Other sizes made available on request.